A 45-foot North Atlantic right whale was rescued from a life-threatening entanglement off the coast of Portsmouth, N.H., yesterday. A fisherman spotted the whale on Jeffreys Ledge, which lies 50 miles north of Provincetown and 25 miles east of Portsmouth, around 7:30 a.m. yesterday and reported it to the New Hampshire Coast Guard. The Coast Guard then notified the Marine Animal Entanglement Response Team at the Provincetown Center for Coastal Studies. Rescuers found the whale just before noon ensnared in synthetic rope that wrapped three times around the whale’s upper jaw and once around its upper body, leading to heavy gear below the animal, said Scott Landry, a member of the rescue team who is director of the Marine Animal Entanglement Response Team. The rescue team positioned its 39-foot vessel next to the estimated 40-ton whale as it came to the surface to breathe, Landry recounted. The rescuers then used a 30-foot pole attached to a grappling hook to make one clean cut to the rope, which subsequently slipped off the whale’s jaw and body. It took the three-person team only 40 minutes to execute the rescue, Landry said. Right whale rescues are treacherous, because the large animals can thrash about or knock into the boat. 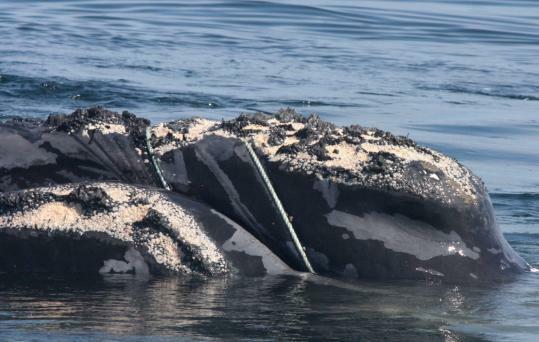 There is no way to know where or how the whale became tangled in the rope, Landry said; right whales are incredibly powerful and can pick up fishing gear and swim thousands of miles. North Atlantic right whales are critically endangered, with only an estimated 400 in the Atlantic Ocean between Nova Scotia and Florida. Rescuers took photos of the whale. The shots will be sent to the New England Aquarium and categorized so researchers can track the whale, Landry said. This was the crew’s fourth whale rescue this year, he said. About 70 percent of right whales and Humpback whales in the Atlantic Ocean have scarring from entanglement, Landry said.